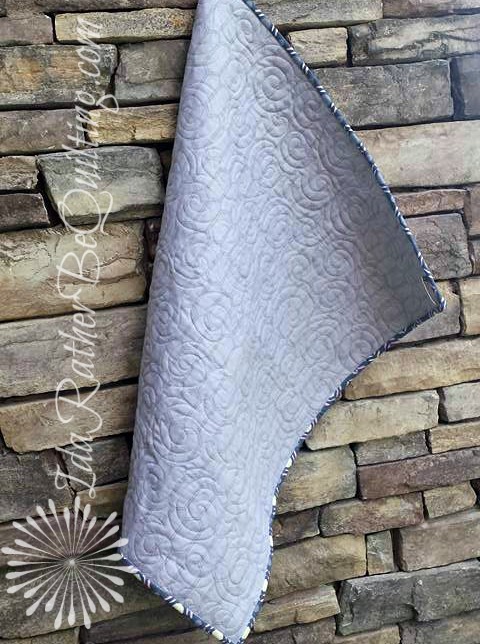 Today I finally get to show you a sweet little quilt I've been working on for Quilt Market from the double gauze Emilia line by Camelot Fabrics. Have you ever worked with double gauze? We quilters are pretty particular about our fabric, aren't we? Good quality cottons are what we like. They are predictable to sew with, dependable to launder, and guaranteed to age into delicious softness. But ever once in a while, it can be fun to veer off the beaten path. Camelot's double gauze is just what it sounds like - two layers of gauze put together. The two layers are actually basted together with thread. If you look carefully, you might be able to see the small holes in the upper corner where the basting thread pulled out when I separated the layers. The fabric has a tighter weave than you would expect from a gauze while still being looser than cotton. Since the pattern I was asked to use was entirely composed of HSTs, I had to be very careful to press and not iron to avoid distorting the bias edges. The pattern, called New Bohemian, is available on Camelot's web site here. It is a well written pattern with two exceptions. There is an error in the cutting instructions for Fabric A. You are asked to cut a 5 1/4 by WOF strip and then sub-cut it into 5 1/2 inch squares. Not possible. It should read sub-cut into 5 /14 inch squares. The second error is the finished size is listed at 34x40. But my finished quilt was a dainty 28x33.5. Some quilt math errors there. If I had been making this quilt for a gift I would've added a border to beef the size up a bit. Aside from those two errors, which I'm sure they will correct, it's an easy pattern and goes together quickly. The big question was how to quilt it? 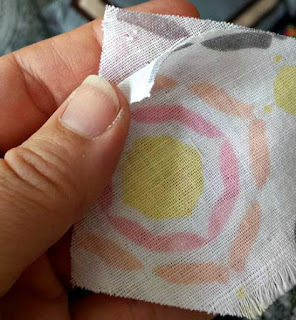 Would I be able to machine quilt a gauze fabric without issues? The answer was surprisingly yes! I did a practice sandwich from leftover fabric and tried it out. I decided to go with a large scale all over swirl. 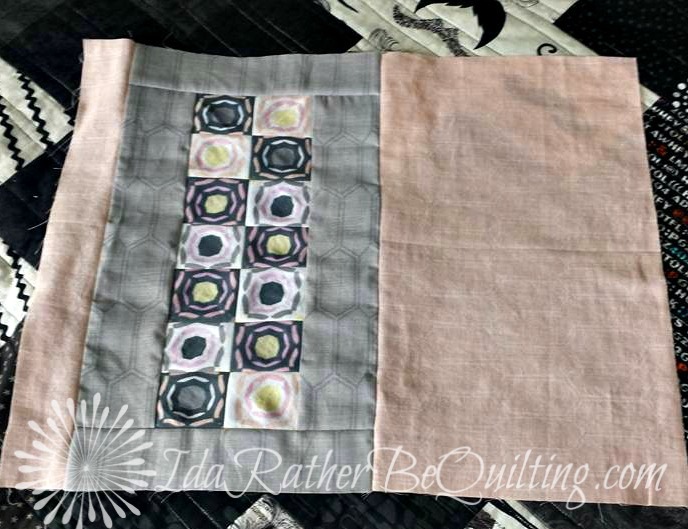 This gave me enough space between quilting lines that I wasn't worried about bunching, tucking, or pulling the fabric out of shape with the quilting. 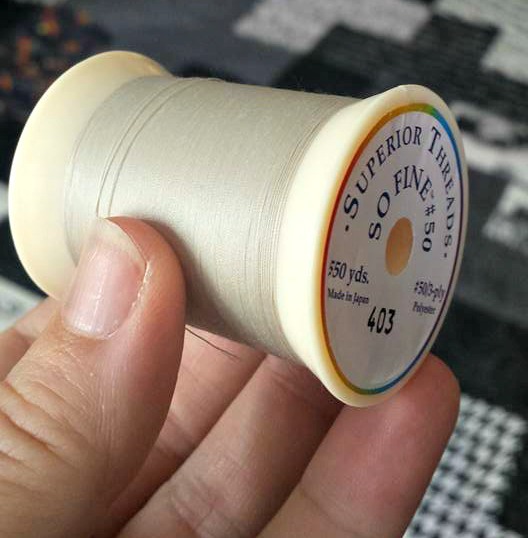 I also opted for a thin thread - Superior's So Fine 50wt. This 403, called Putty, is one of those magic colors that just blends. 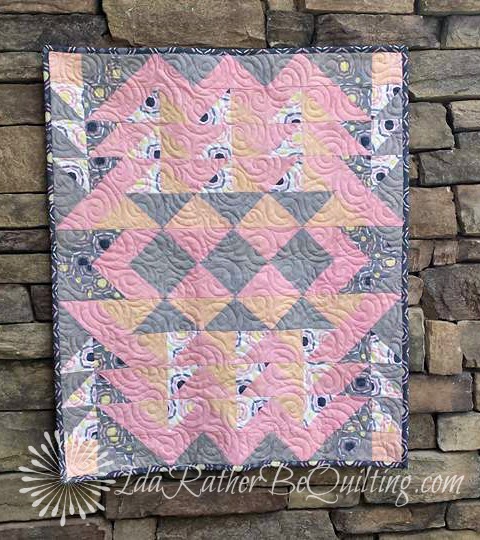 Across the pink, the peach and the gray it just melts into the quilt. And So Fine is a great thread. My machine loves it. I had enough left to piece a mini quilt. I went a totally different direction with it and focused on the bull's-eye prints in the light and dark colorways set into the mid value solids. Still undecided how I will quilt this one. If you are heading to Quilt Market, visit Camelot Fabrics and visit my Baby Bohemian. And don't be afraid to pick up some of this lovely Emilia double gauze. Step off the beaten path and sew on the wilder side! Your talent never ceases to amaze me. You are INCREDIBLE!!!! As the lucky recipient of one of your quilts I can say that the pictures really do not do them justice. They are just exquisite!!! Aw! Thanks Julie. You are sweet to say so. Your result is very beautiful. I've never used double gauze but I've been tempted . 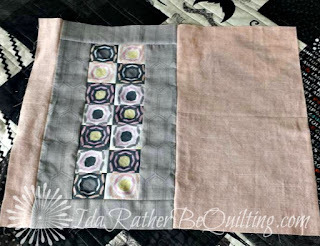 The quilt looks great, and having thread on hand that magically blend with a wide variety of colors is such a help. I've never sewn with double gauze, so it is good to see how wonderfully it can turn out! What a great pattern. You quilt turned out wonderfully. I love it, what an amazing quilt! What a beutiful quilt! The colors are so soft and just pretty! Thanks for the info on the double guaze! Good to know!! You'll have a quilt at MARKET?! Go you!!! How exciting :D I've never used double gauze. The price deters me more than the learning to use a different substrate does. I would think it would be lovely to hand quilt though. Your quilting on this was spot on (no shocker there ;-) Beautifully done.